is guided by an annually approved calendar, detailed here. Poland Board of Education adopts proposed $14.7 million 2019-20 budget. To read the whole story, click here. 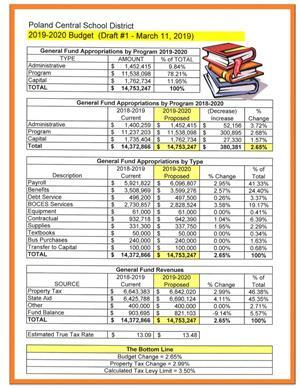 Draft #3 of the 2019-2020 Budget was presented to Board Members. Draft #2 of the 2019-2020 Budget may be found here. This was developed with anticipated BOCES services and programs. Draft #1 of the 2019-2020 Budget may be found here. This was developed without the enacted NYS Budget numbers available.